The Turkish Spiced Hake with Yogurt Sauce came about because I wanted to change up the cooking of fish and be a bit more adventurous with the flavors. I came across a recipe by David Tanis that I had been meaning to try using halibut skewers on the grill, but it’s the middle of winter and I had a fillet of the less expensive hake in front of me. So I made some alterations in the cooking method and changed a bit of the seasoning as well. I wanted the fish to have a zing to it but not so much that you don’t taste the underlying flavor. The cumin, coriander and smoked paprika gives it that middle eastern taste and a pinch of chilli flakes provides a bit of heat. I also added a some harissa to the yogurt sauce to add a bit more punch. 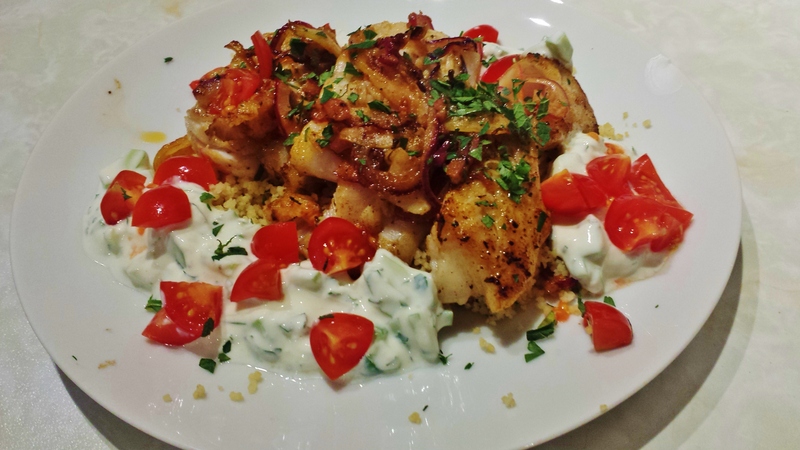 The addition of the couscous really makes this Turkish Spiced Hake with Yogurt Sauce into a delish middle eastern dish. For the cooking, rather than a grill, I suggest using a nonstick or seasoned cast iron skillet. Get it really hot, sear the fish both sides and then turn down the heat to let it cook through. Happy to share it with the Cooking with Adrienne Community. This Turkish Spiced Hake with yogurt sauce puts a totally different spin on cooking fish. Step 1 Cut the hake into large chunks of equal size and season with salt and pepper. Step 2 In a mixing bowl, combine cumin, coriander, paprika, red pepper flakes, onion, lemon 2 garlic cloves grated, and bay leaves. Add olive oil and stir together. Add fish to the bowl and toss to coat. Leave to marinate for at least 1 hour. Step 3 Put the yogurt in a bowl and season with salt and pepper. Grate 1 garlic clove into the yogurt and add harissa and cucumber. Add half of the mint and parsley stir to combine and set aside. Step 4 To make the couscous measure ¾ cup of couscous into a bowl. Pour 1 cup of boiling water into the bowl. Stir to combine and cover with plastic wrap. Set aside. Step 5 Heat a frying pan (nonstick or seasoned cast iron) over high heat. When the pan is hot add the hake along with the marinade. Cook without moving the fish for about 5 minutes. Turn the fish and cook for 3-5 more minutes until no longer translucent but not overcooked. Remove from heat. Step 6 Stir ½ the remaining herbs into the couscous and place a mound on each plate. Place the fish along with some of the onions and lemons on top of the couscous and sprinkle remaining herbs on the fish. Serve the yogurt along side and scatter the chopped tomatoes.